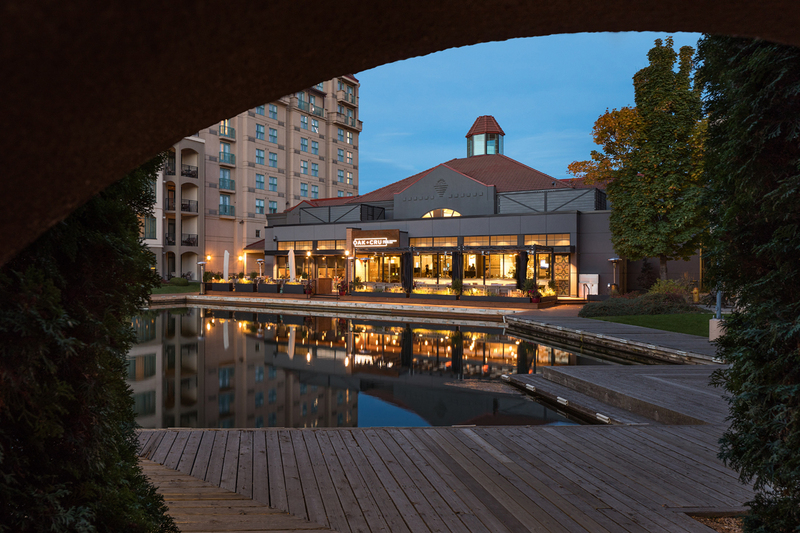 How do you draw upon Canada’s premiere wine country to inspire an urban resort? 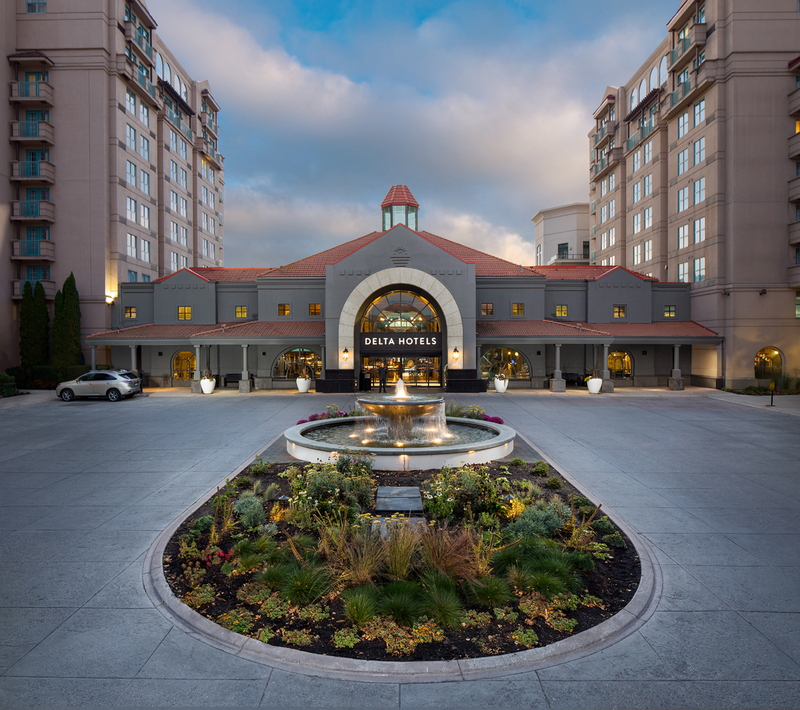 Tucked in the rolling hills of the Okanagan Valley, among world-renowned vineyards and orchards, the Delta Hotels by Marriott Grand Okanagan Resort is intrinsically tied to the geography of the region and infused with a deep sense of place. Owing its legacy as Canada’s premiere wine grape growing region to the unique climate and geography of the area there is much to be explored and celebrated in the Okanagan Valley Region. Visitors to the property will feel an immediate connection to nature through the colour and material palette. Taking cues from nature it contrasts deep earth tones with punches of rich saturated hues inspired by the changing seasons. The welcoming sense of arrival draws upon the late 18th and early 19th century Californian Spanish Mission architecture, with broad unadorned surfaces, rich terra cotta barrel roof tiles, thick arches springing from piers and a cordial courtyard. 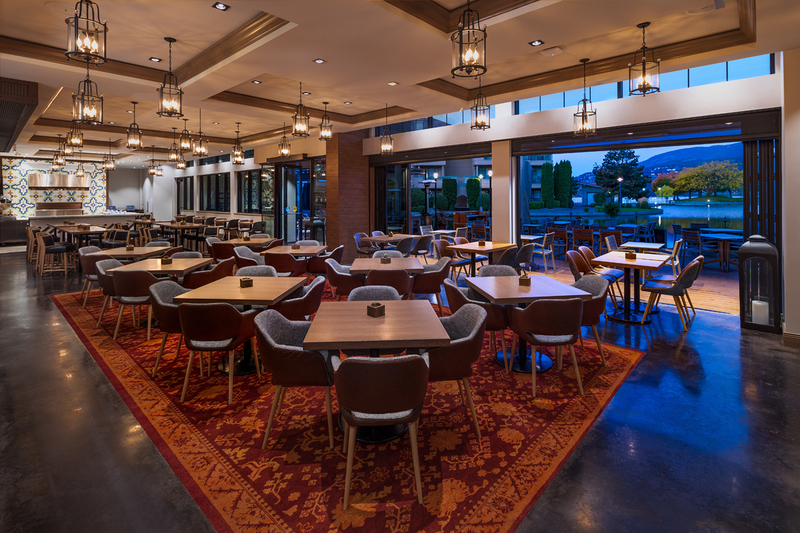 Our design team drew their inspiration from the bounty of the Okanagan Valley, which includes over 200 wineries and many local purveyors and artisans. 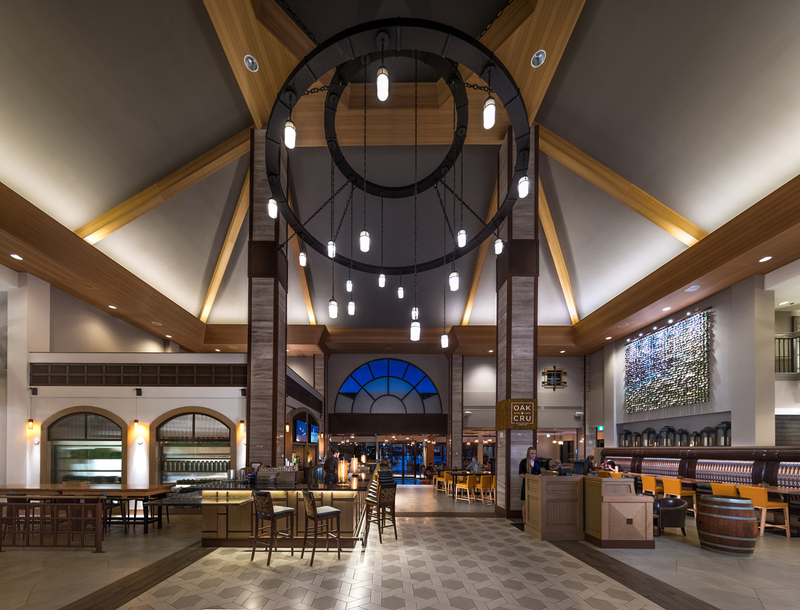 An extensive feasibility study of the food & beverage offerings was carried out, which quickly confirmed the need for an expanded and consolidated bar and restaurant offering. 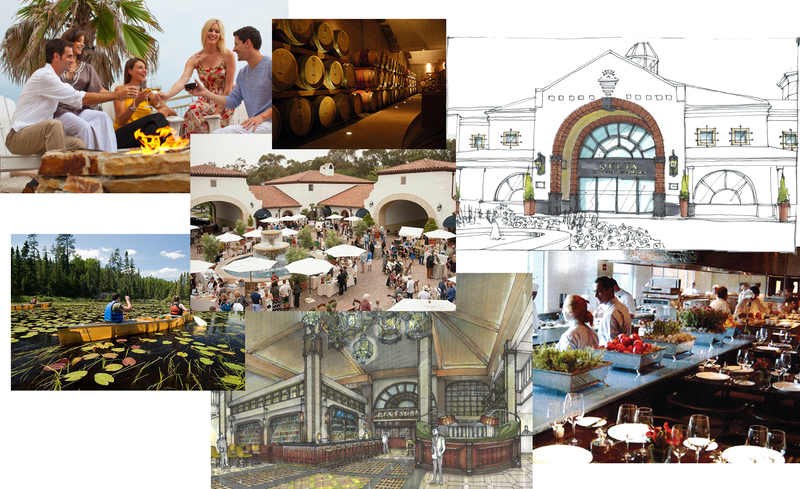 As a result, the new wine bar was given a prominent position in the lobby and an expansion was added for a new restaurant and patio space on the property's waterfront. 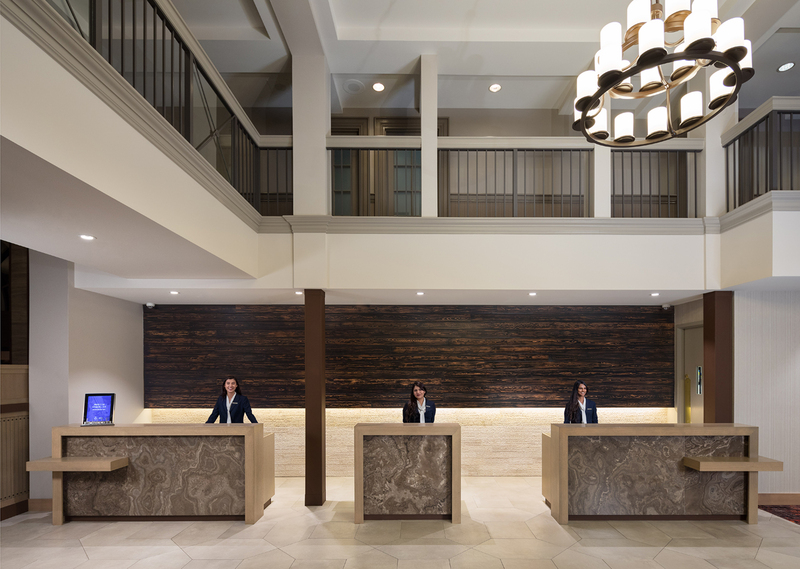 Warm natural woods and stones welcome you to the resort and compose the architectural features. 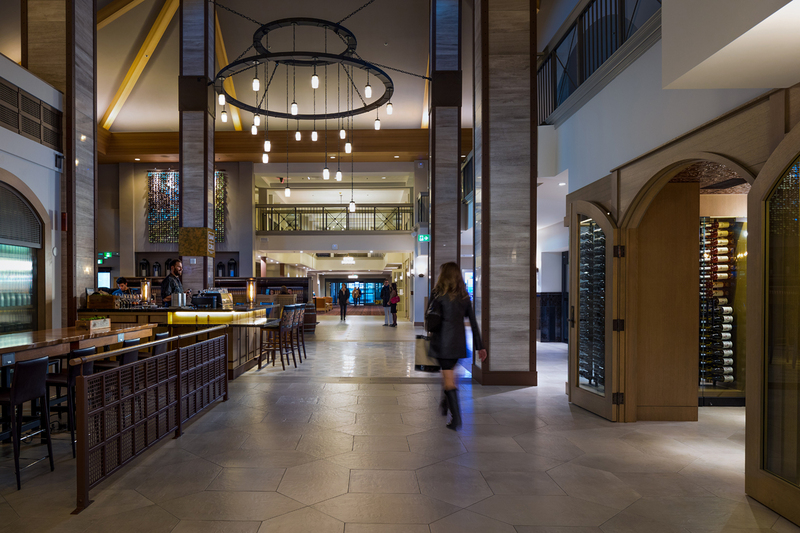 A layered textural feature wall leading guests from lobby to restaurant reinforces the Okanagan Valley’s unique geographical composition. 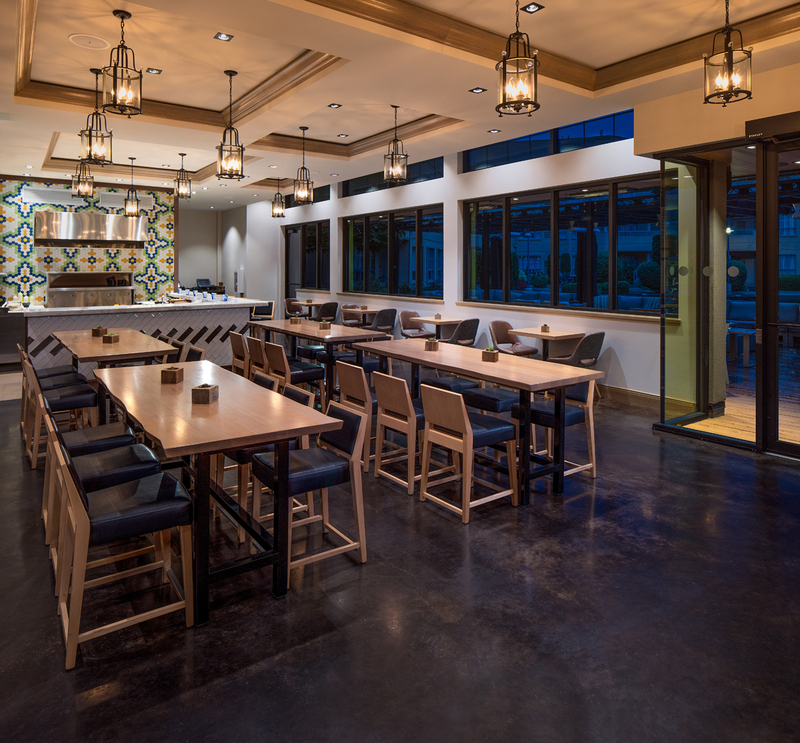 Carefully chosen furnishings enhance the resort feel, welcoming and engaging guests while providing space for business, relaxation, and socializing. A unique exploration of these themes keeps the mood contemporary. The proposed design is rustic yet timeless in that it provides a backdrop reflective of the abundant richness of the region and allows for the property to continually transform over time. 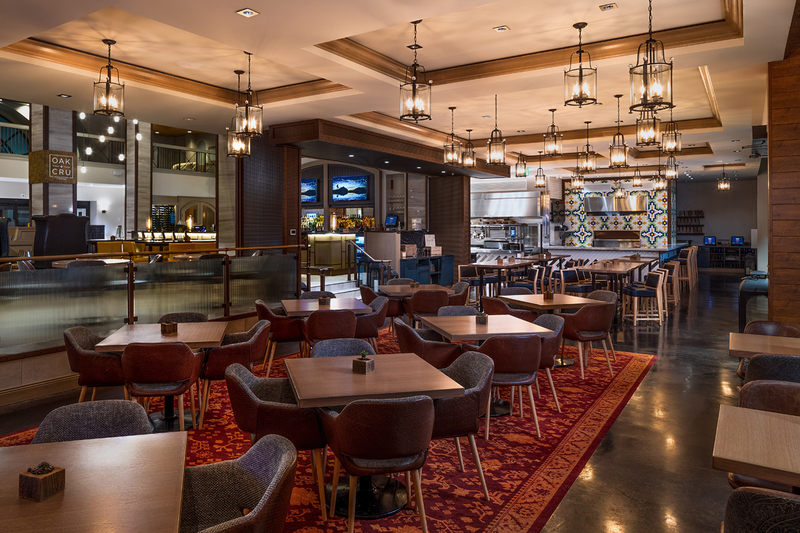 The kitchen concept is built on the unique and modern presentation of globally inspired cuisine, with a local “Farm to Table” twist. 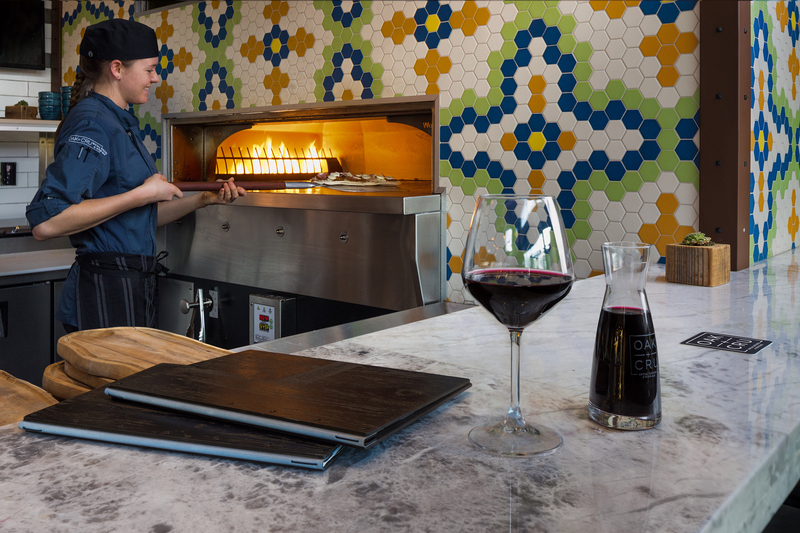 The signature Wood Stone oven provides the anchor for menu content throughout each meal period, while using fresh high quality products that are locally and regionally sourced. 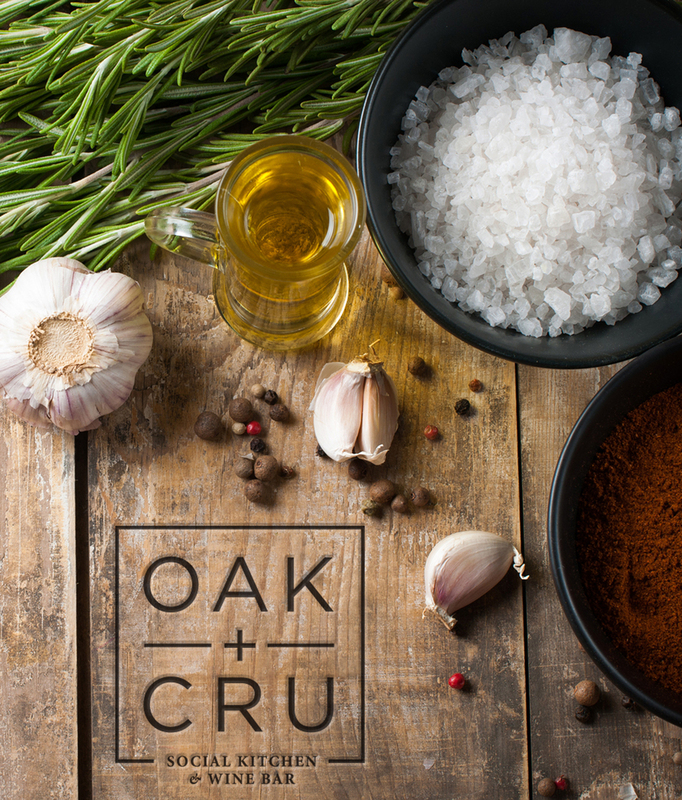 A modern yet timeless name, brand identity and position was developed for the resort's upscale restaurant and bar, Oak + Cru Social Kitchen & Wine Bar. It pays tribute to references found in the wine making process, while speaking to the notion of socializing. 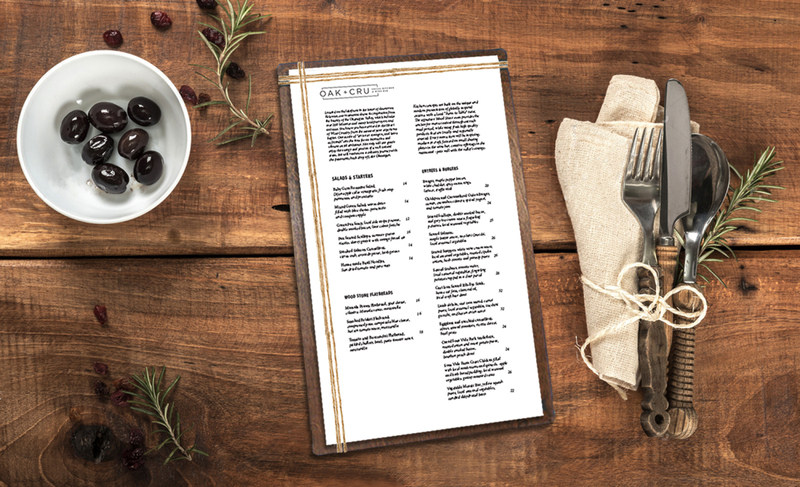 Defining a position and character for the food & beverage culinary direction and establishing a contemporary brand essence set the tone for the signage and menu program. 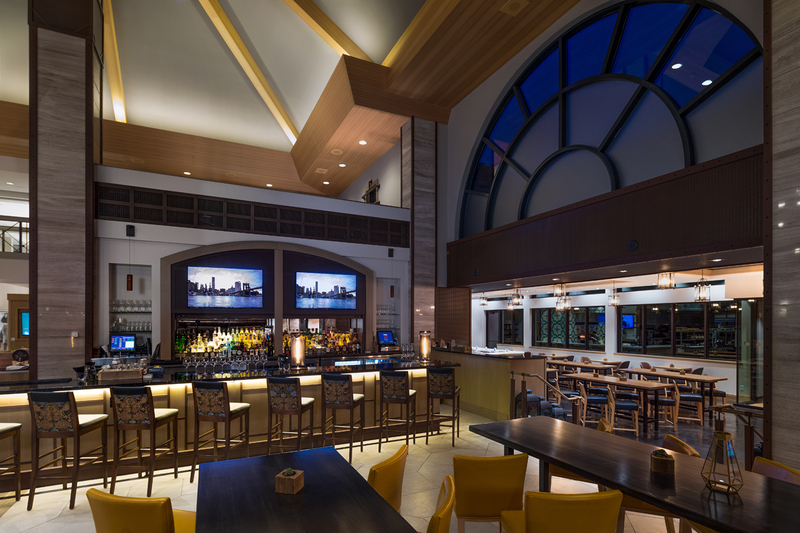 Oak + Cru can be accessed by hotel guests and locals alike through the grand hotel lobby or the inviting waterfront patio.